Jeet Kune Do, “the way of the intercepting fist,” is a hybrid martial arts system and life philosophy founded by world-renowned martial artist, Grand-master (SiJo) Bruce Lee. Jeet Kune Do is non-traditional and non-classical, ever-changing and evolving, and fluid and spontaneous. The techniques are simple, direct and effective without wasted motion or unnecessary movements. Jeet Kune Do utilizes broken rhythm, non-telegraphic techniques and an economy tight structure (traveling the path of least resistance). 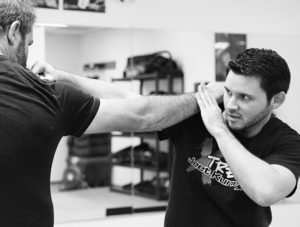 Jeet Kune Do training emphasizes Taoist and Zen philosophies, intercepting fist techniques, and overall body fitness and conditioning.